CD reviews: "Last Night/Do the Popeye," "Stax Instrumentals" and "Soul Men"
If you want to understand the beat of American popular music over the past third of a century, here's a three-disc course just out from Stax. No midterm, no finals  just thick grooves that define the meter and rhythm of modern urban life in these United States. For four four decades now, Donald "Duck" Dunn, Steve Cropper and Booker T. Jones have been laying down the American pulse  first as the Mar-Keys, then as Booker T. & the MGs (and, of course, perhaps most famously  sans Jones  as the heart of the rhythm section of the Blues Brothers Band). Drawing in equal parts on black and white traditions, the Mar-Keys/MGs have distilled the common threads that create the American sound. In their hands, country and jazz not only sit side by side, but reveal themselves as the cousins they truly are. Rockabilly and blues co-illuminate; Motown and Nashville and Huntington Beach and Muscle Shoals and New York and New Orleans  they're all here. These three new compilations from Stax' collection contain a wealth of old singles and lost tracks not heard in the U.S. before (several had been issued in Europe  go figure). Going back to the early 1960s, Jones (organ), Cropper (guitar) and Dunn (bass) had been the house band for Stax Records' recording sessions in Memphis. Backing everyone from Otis Redding to Albert King, Rufus Thomas to Sam & Dave, they also scored their own mega-hits in "Last Night," "Hip Hug-Her" and "Green Onions." You won't find that here, although it's in "Time is Tight," the box set issued a couple years back. What you'll find here are outtakes and singles not available before in the U.S. on CD, all of which show why this was long regarded  and, truth be told, still is by a an awful lot of musicians  the best band in the world. Want to know where Belushi and Akroyd got the balls to cover Steve Winwood's "Gimme Some Lovin'" for their Blues Brothers shtick? 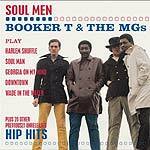 It's right here  all they did was add the vocals over the thick as sausage gravy on a cold winter morning groove on the "Soul Men" collection. Curious as to how they might have handled meatier Beatles' material than they did on "McLemore Avenue," say something like "Day Tripper"? Wonder how Petula Clark's "Downtown" might sound if turned loose? Paul Anka's "Diana" as an uptempo dance number? Errol Garner's "Misty" as a lush R&B torch song? The answers are all here on these three discs. Mostly what you'll find is that all-American meter  the ancestral proto-groove that underpins everything from Harry Connick Jr. to Snoop Dogg, LeAnn Rimes to the Back Street Boys. Dunn's staggered, syncopated bass lines, Cropper's sharp fills on guitar and Jones' jazz-tinged organ leads create music that is immediately infectious, still swings like mad forty years later, and is as listenable as it is influential. Forget all the academic theory above  put any one of these three discs in the player next social gathering and see how quickly toes start to unconsciously follow the beat, feet start tracing out small dance steps in midst of small-talk conversations. Four decades strong, this is still the best party music ever laid down.